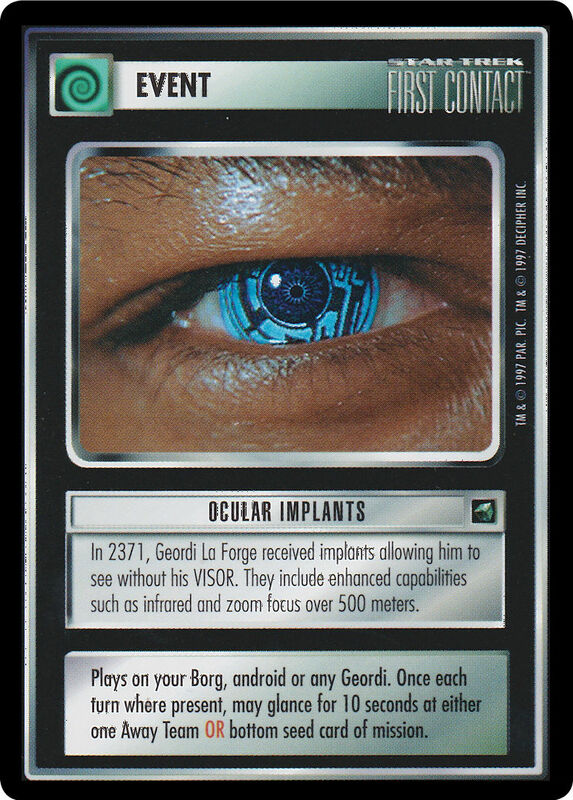 In 2371, Geordi La Forge received implants allowing him to see without his Visor. They include enhanced capabilities such as infrared and zoom focus over 500 meters. Plays on your Borg, android or any Geordi. Once each turn where present, may glance for 10 seconds on either one Away Team OR botton seed card of mission. Requires: affiliation, any Geordi, Android "species", Borg species. There are 34 entries for Ocular Implants (ST1E 4 R 32) at the Tradeplace (39 haves and 9 wants). Click here to see all trade list entries for this Rare card!